Location: Castlecaulfield, County Tyrone, Northern Ireland. Notes: Castle Caulfield is a large ruined house situated in Castlecaulfield, County Tyrone, Northern Ireland. The building was three storeys high with attics, many large mullioned windows and tall chimneystacks. A joist from one of the walls was dated using dendrochronology to about 1282 and may belong to an earlier fort. There are substantial remains. The oldest part of the existing building is the gatehouse, which has Tudor-style doorways, murder-holes and gun-loops. The Caulfeild arms appear over the entrance. The house was built by Sir Toby Caulfeild between 1611 and 1619 on the site of an earlier O'Donnelly castle. It was burned in the Irish Rebellion of 1641 but was repaired and reoccupied by the Caulfeilds until the 1660s. 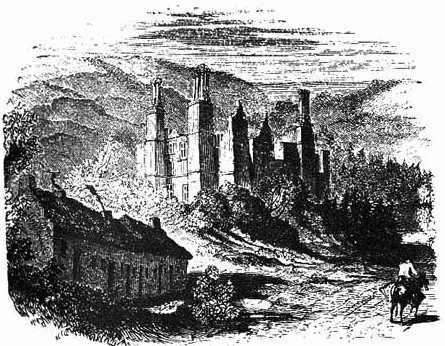 Oliver Plunkett is known to have held a service at the castle in 1670, but the castle was in ruins when John Wesley preached there in 1767. Castle Caulfield, Present Day Castle Caulfield, today a ruin, is a State Care Historic Monument in the townland of Lisnamonaghan, in Dungannon and South Tyrone Borough Council area, at grid reference H7550 6260.